Bed is completed and ready for the handmade paper quilt. 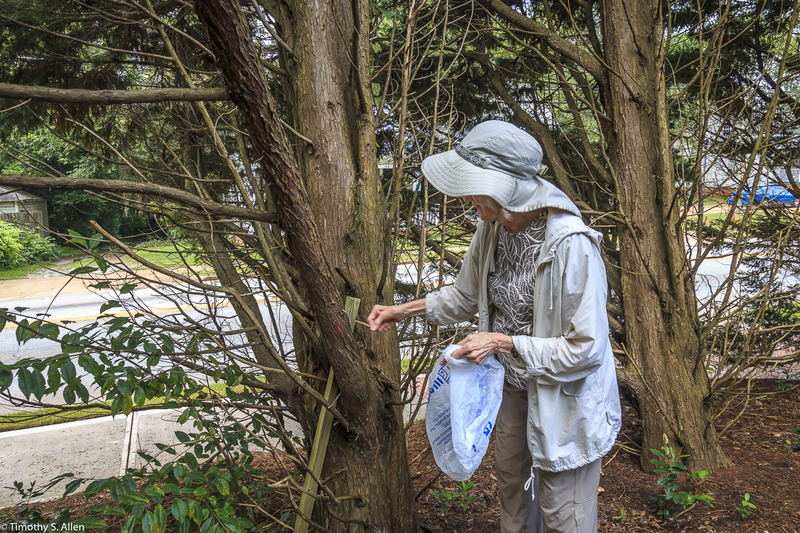 Local volunteers added lots of hydrangea blossoms to decorate the headboard and footboard that are made from local branches. 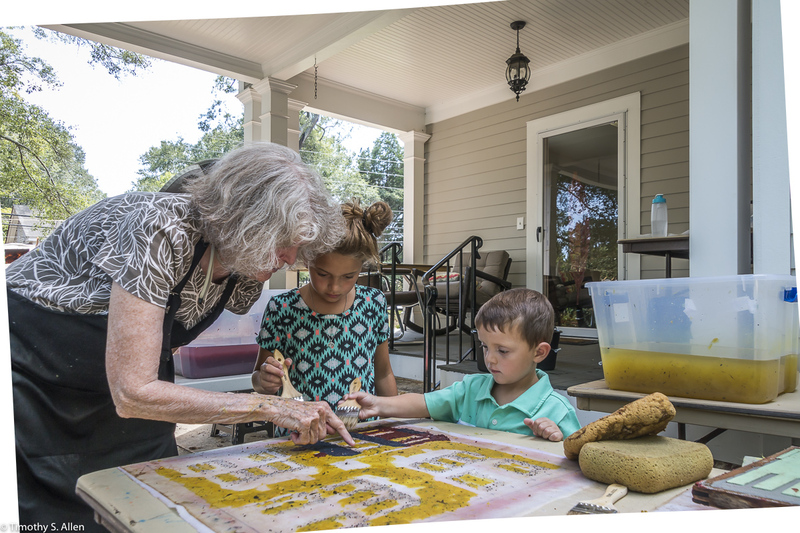 Everyone is invited to the installation ceremony and dedication of the Newnan Living Quilt tomorrow August 31 at 6 PM in Newnan, Georgia, at the site next to the old Male Academy and corner of Temple and College Streets in downtown Newnan. 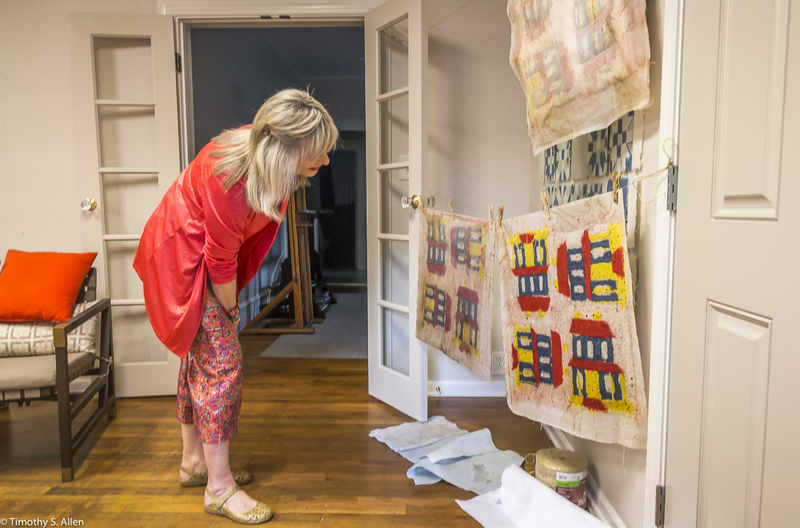 The quilt was made with community participation in Open Studio sessions at the Gray Cottage. 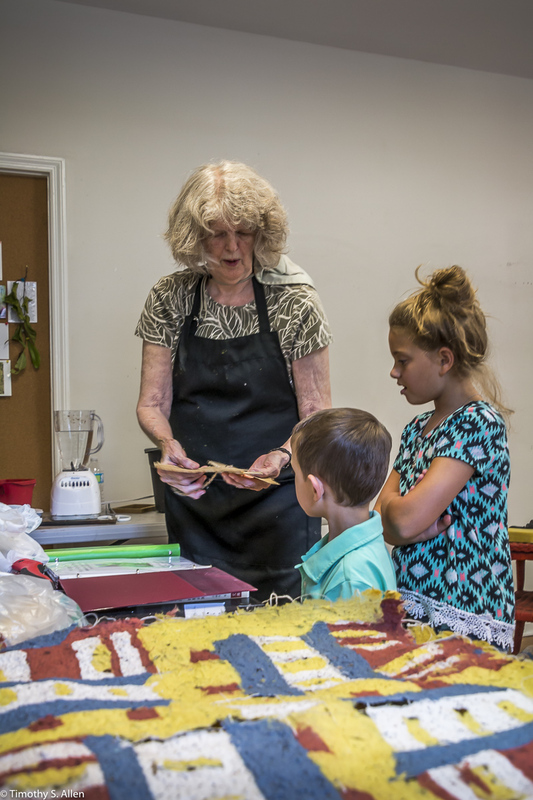 The quilt has a house pattern and is created with handmade paper from plants of Newnan and has seeds for wildflowers in the pulp to change over time and become a living blooming work of art. 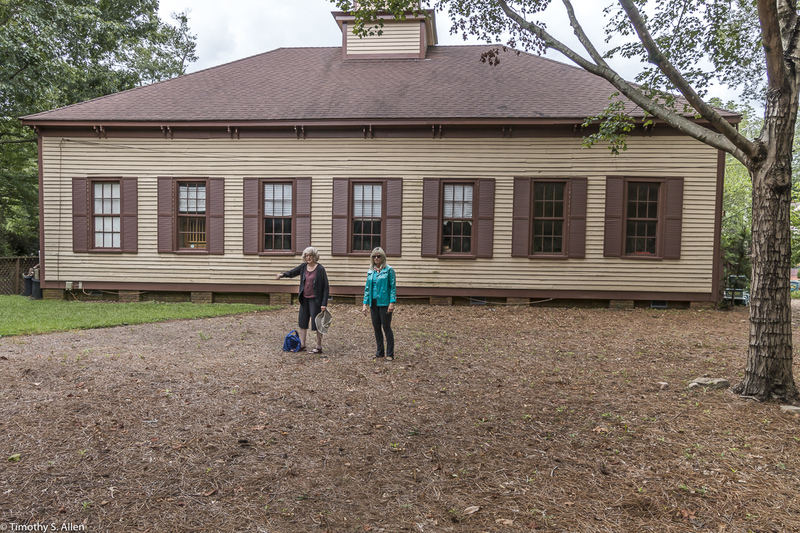 Check back here to see the photos of the installation and the finished public art project that I have created during my 3 week artist in residency at Newnan Art Rez, Newnan, GA. It has been a great experience and a wonderful community to work with. Thanks everyone for such good support and participation! 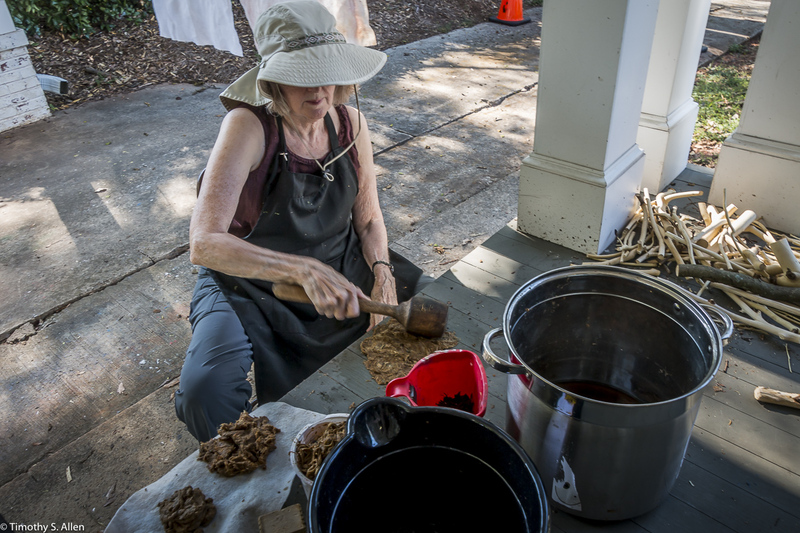 Meredith Wilson came by the Gray Cottage to visit my studio and brought some wisteria bark from her farm for me to use for papermaking. 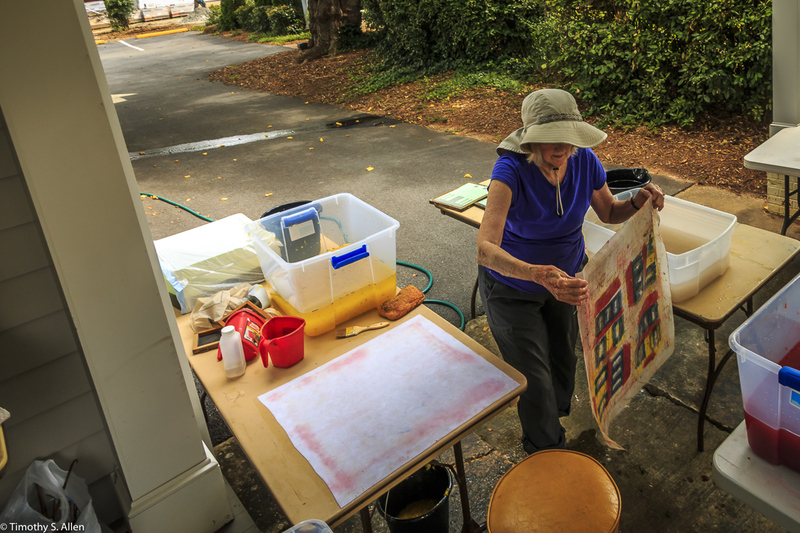 I am an artist in residence from August 8 to Sept. 1, in Newnan, GA, at Newnan Art Rez. 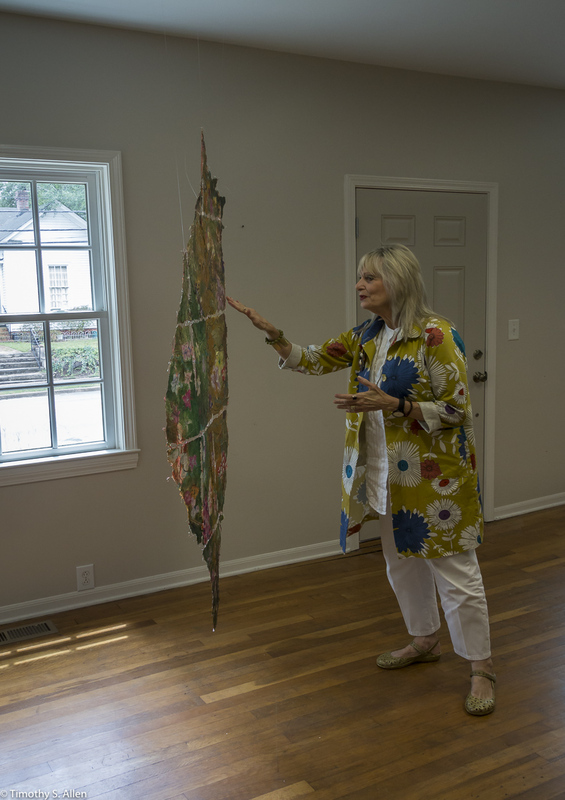 The Newnan eco quilt and “flower bed” will be ready for installation and a dedication ceremony at 6 PM on August 31 at the site. 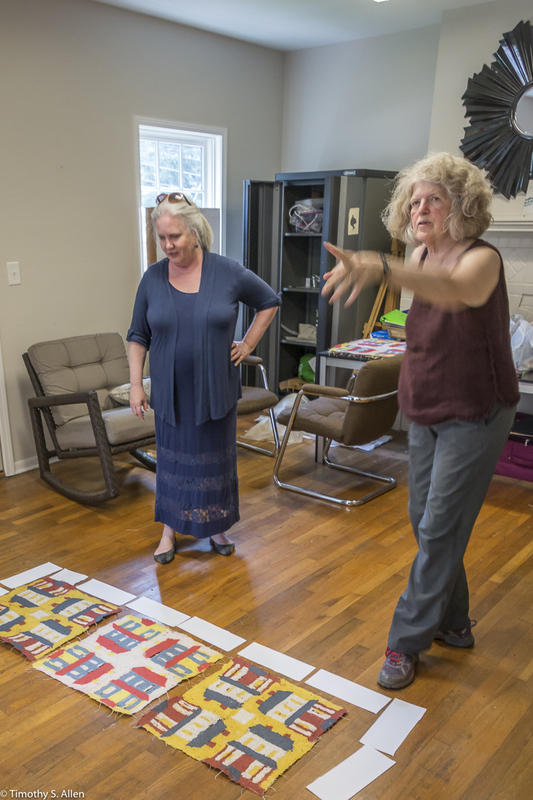 The Newnan eco-quilt will be installed on the grounds of the old Male Academy near the corner of Temple and College Streets in downtown Newnan. The place for the “bed” has been marked off and the city has cleared the ground, and soil to build up a bed shape has been brought in. I will be working at the site starting on Friday and creating a headboard and footboard of local branches and vines. 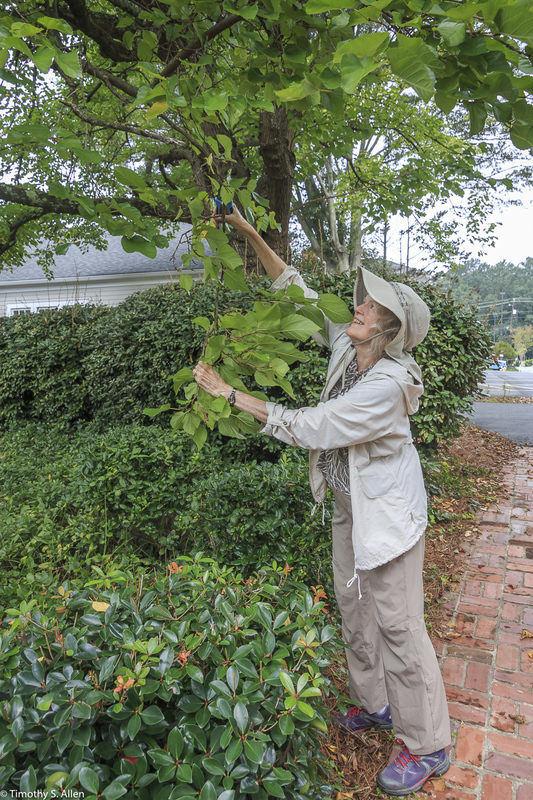 Volunteers are encouraged to bring any tree trimmings or vines that they trim to the site of the installation to use in the headboard and footboard. 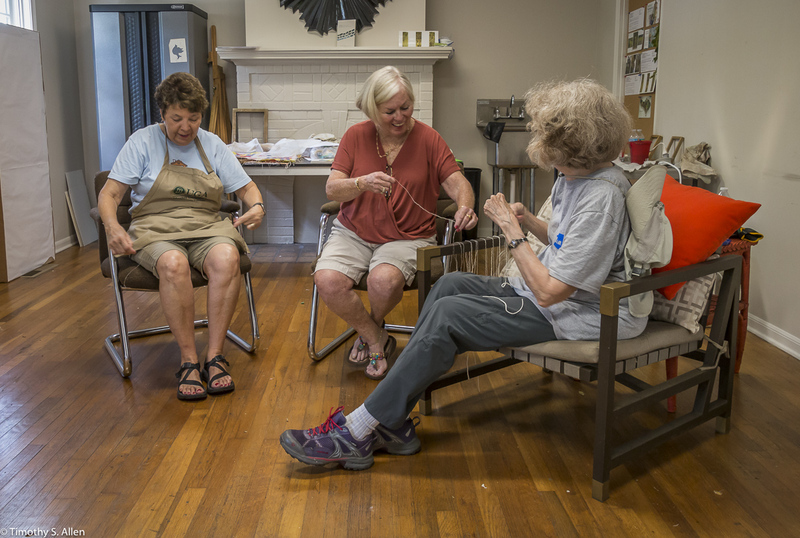 Open studio times for helping with the weaving of a headboard and footboard and helping to shape the bed will be 10AM to 2 PM at the site. Everyone is welcome to come to the dedication ceremony too at 6 PM on August 31. 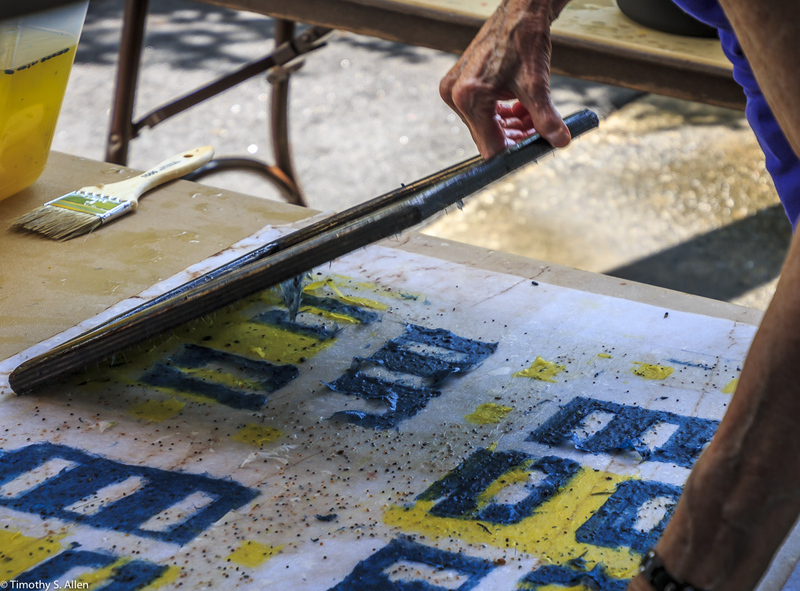 These photos show progress on the handmade paper quilt that will be about 6 feet x 8 feet in size. 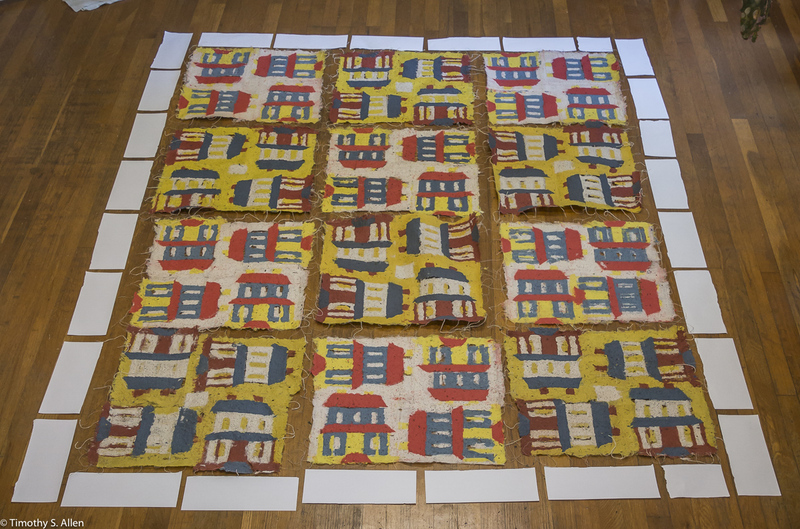 The quilt blocks are a house design since Newnan is known as the “city of homes” Here you can see the quilt block laid out on the floor of my studio at Gray Cottage. 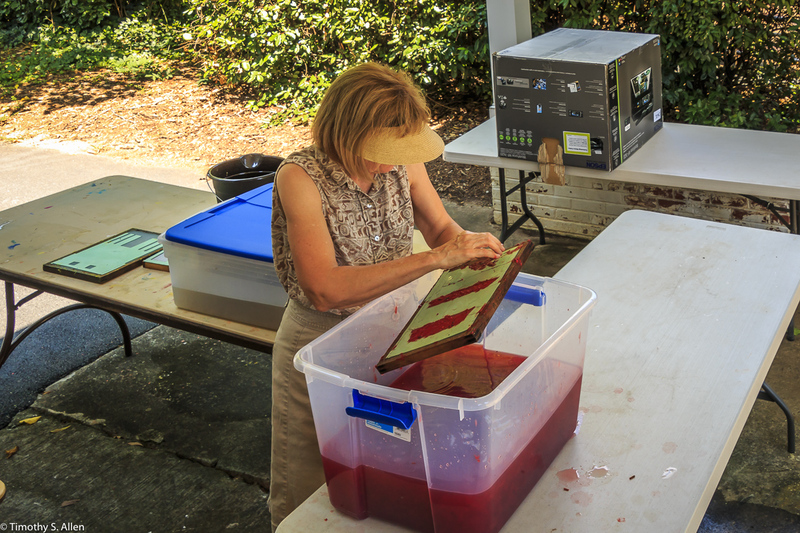 For the pat two days I have been making borders for the quilt that will be an off white color of pulp using all the plants I have used in Newnan for hand papermaking. 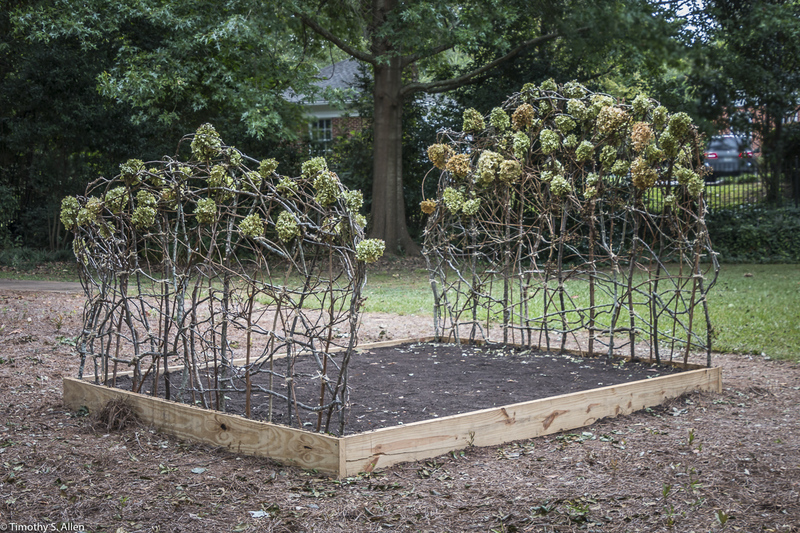 More photos will be posted soon of the “bed” making and the installation at the site. Photos here are by my husband Timothy S. Allen (allentimphotos2.wordpress.com). Next week we will be busy at the site creating a bed form of soil and making a headboard and footboard out of local branches. Come join in if you are in the area. 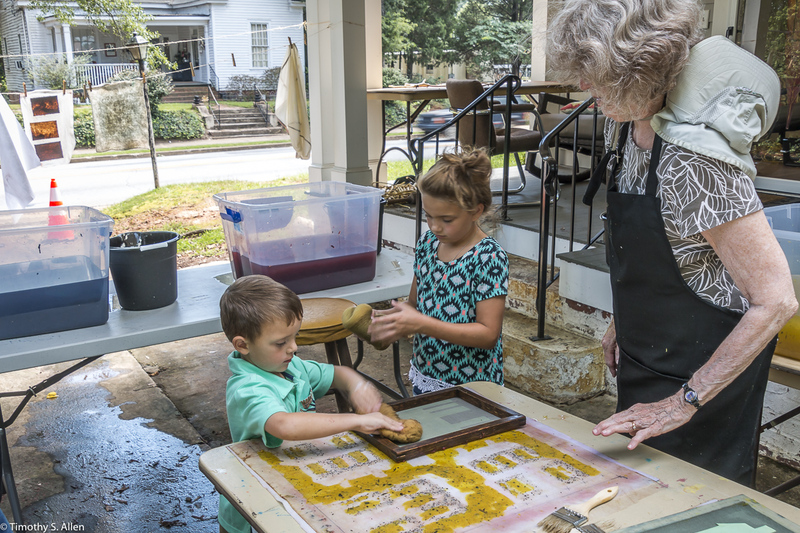 Keep watching this Blog for more photos of my Newnan GA artist in residency project. 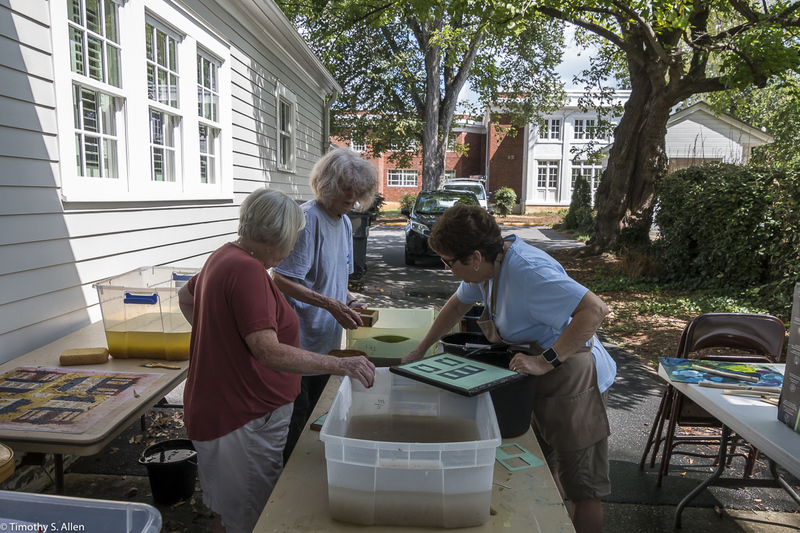 Jan Bowyer and Marcy Ward, Newnan Master Gardeners, came over to the Gray Cottage to help with the papermaking during my Newnan Artist in Residency. 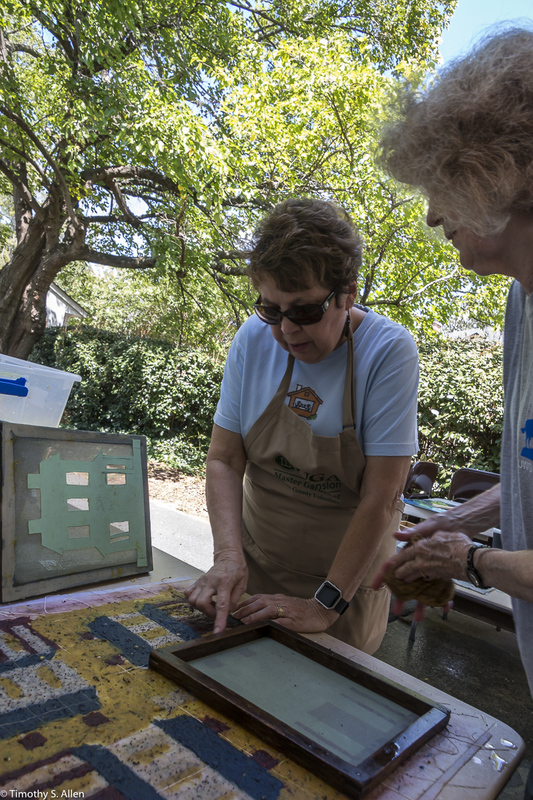 The Newnan Master Gardeners group will be helping out also with the making of the flower bed in the park for the installation of the handmade paper quilt with seeds in the pulp to produce wildflowers over time. 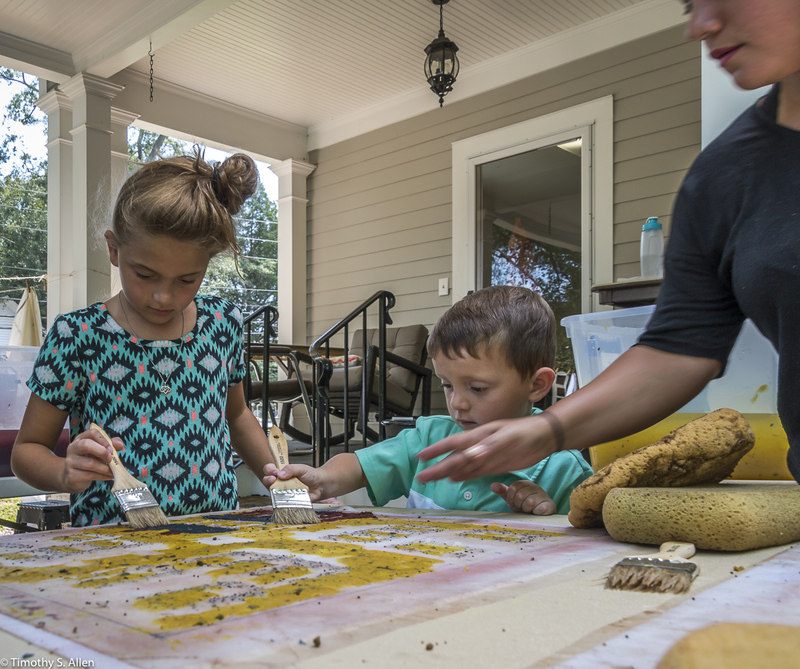 I am an artist in residence at Newnan Art Rez (http://newnanartist.org) from August 8 to Sept. 1, 2017, and we are creating a Newnan Eco Quilt with a house theme. 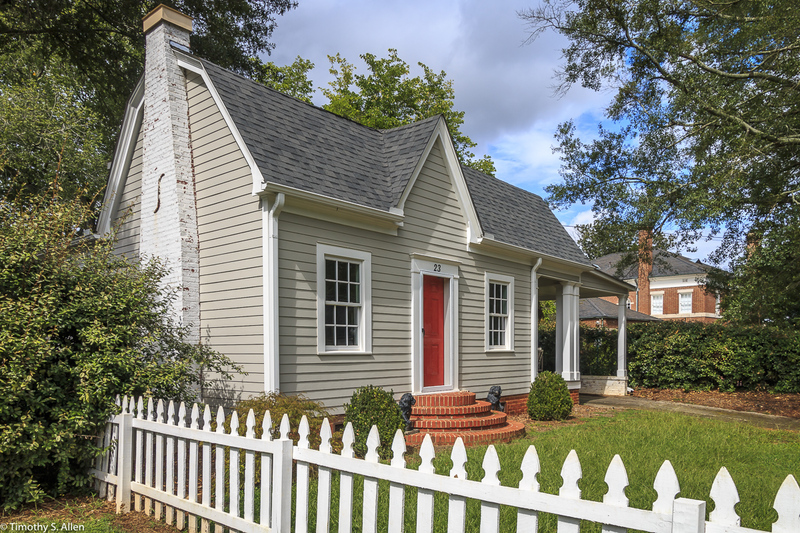 Newnan is known as the “city of homes” because of all the beautiful old homes there. Newnan is in the state of Georgia about 45 minutes southwest of Atlanta. 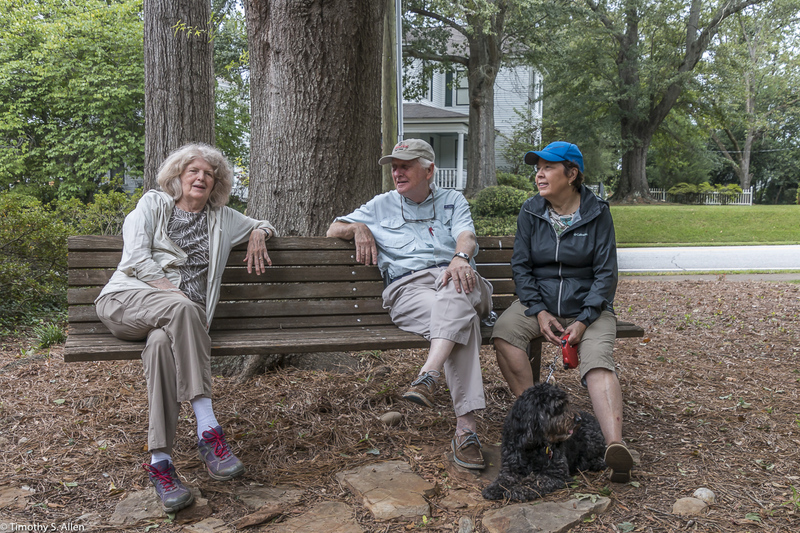 We are enjoying the countryside and the people and the many wonderful restaurants too during our stay in Newnan. 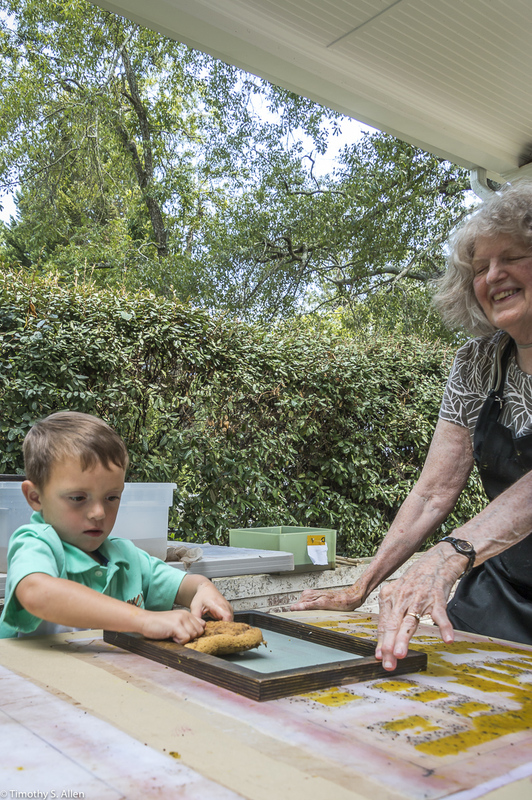 These photos are by my husband Timothy S. Allen who came with me to Newnan to document my art project. 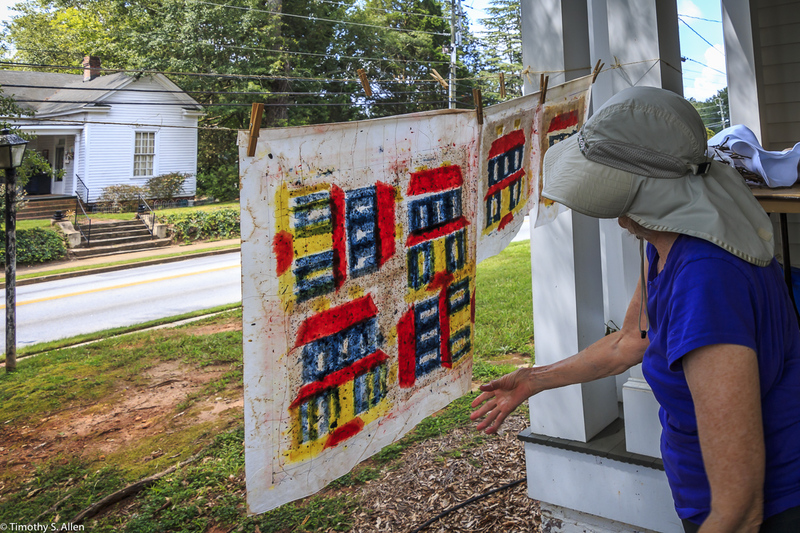 a finished square of the Newnan “house quilt” hanging to dry. 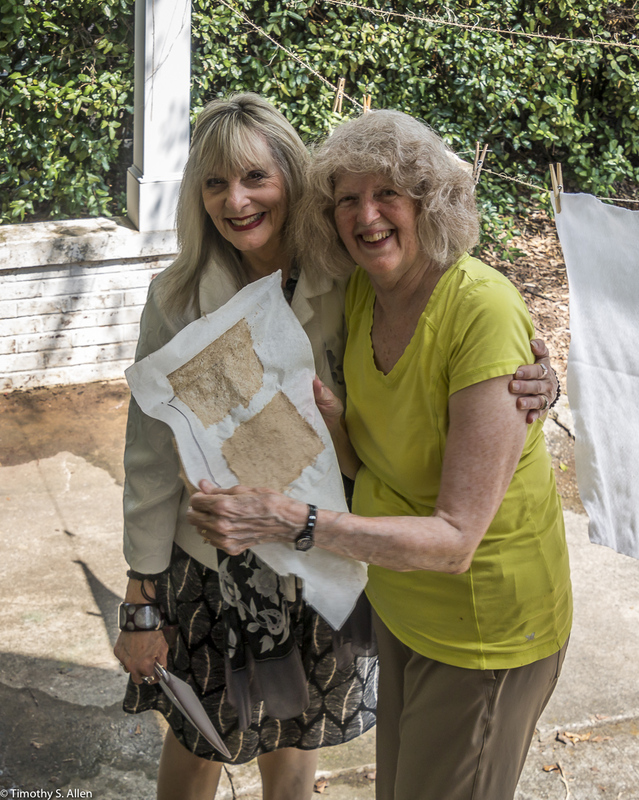 The Newnan eco-quilt will be installed on August 31 at a special ceremony. 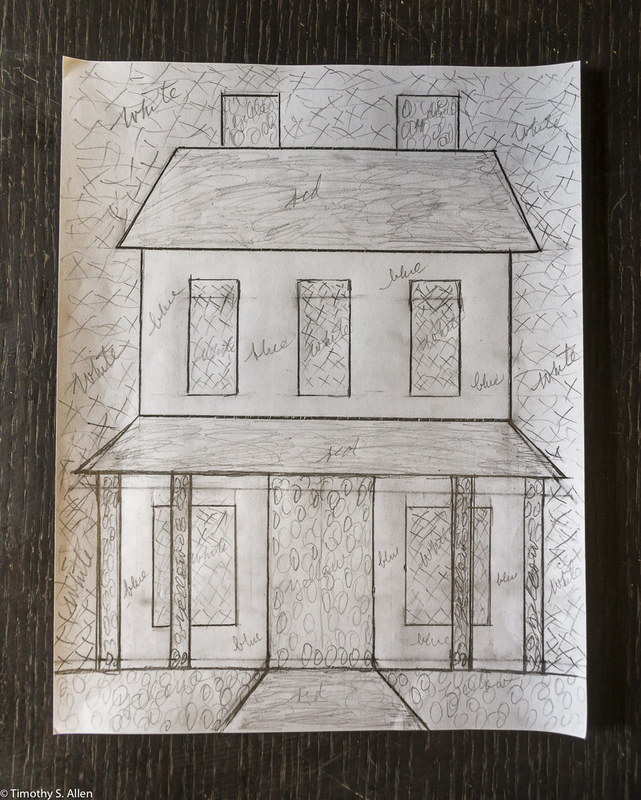 Keep looking at this blog to see the finished art installation that will be on the grounds of the old Male Academy in Newnan at the corner of College and Temple. More photos will be posted here soon. 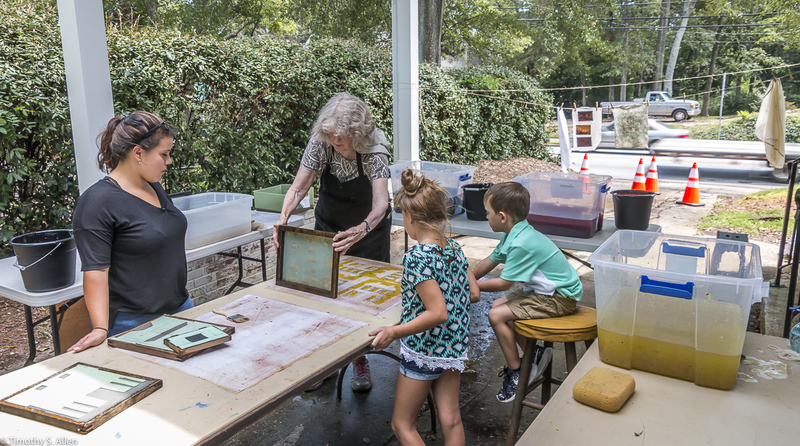 Come join us for the papermaking open studios this week at Gray Cottage, 23 Clark Street in Newnan, GA.
Andrew McCabe, Newnan Art Rez board member, helping set up the tables for the outdoor studio at Gray Cottage. 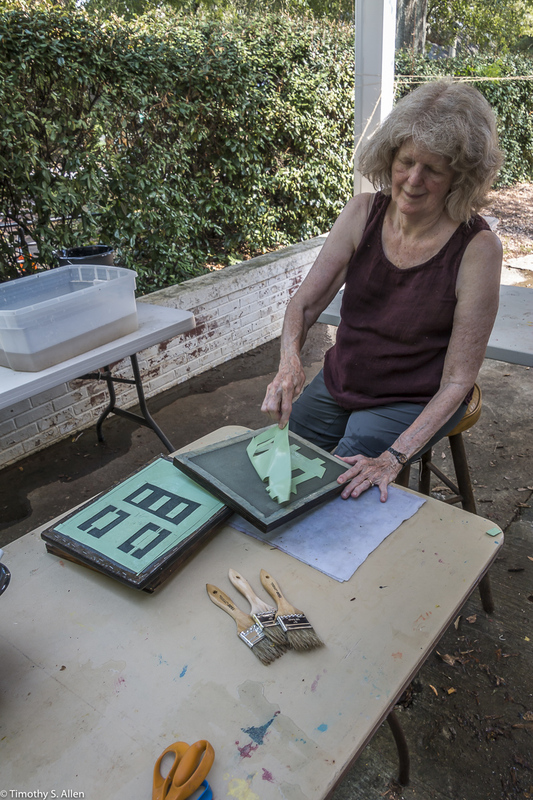 Andrew McCabe, a Newnan Art Rez board member, came by to visit and looked at some paper sample books and helped us to set up the outdoor studio working area at Gray Cottage. 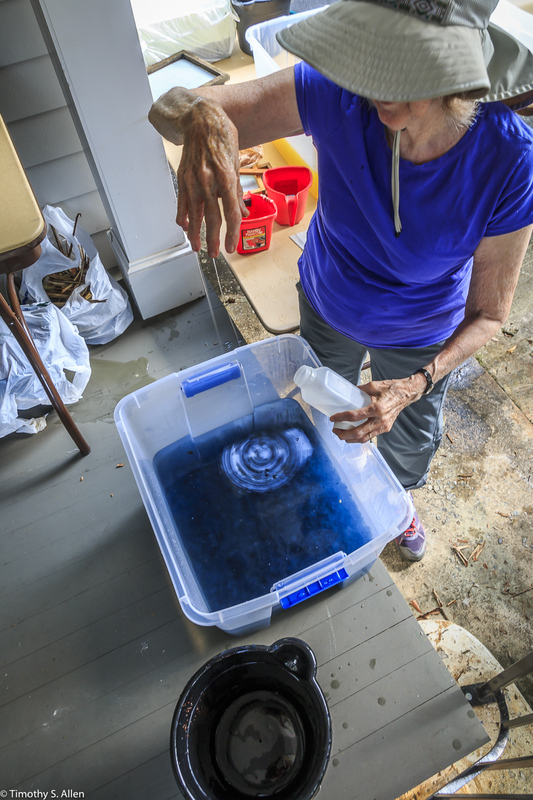 Adding some formation aid to the blue colored pulp vat. 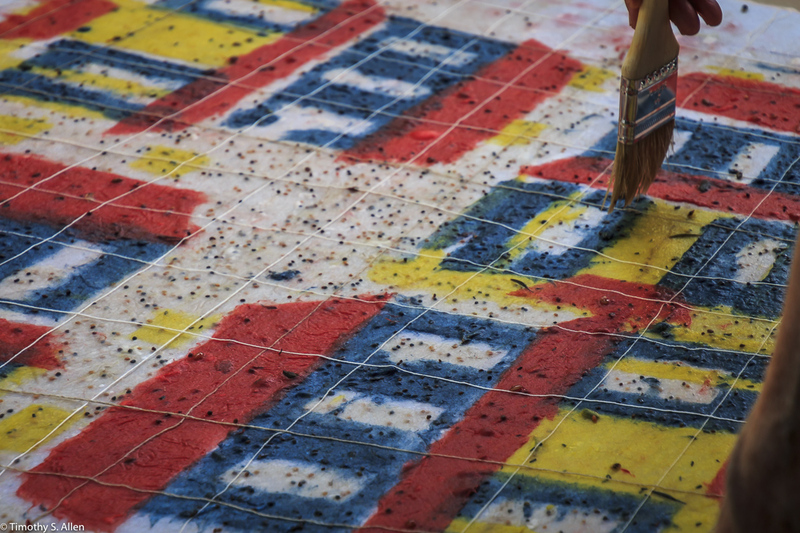 Bringing the quilt block inside to dry. It is a little windy outside sometimes in the afternoon so we bring them inside to dry on a clothesline overnight. 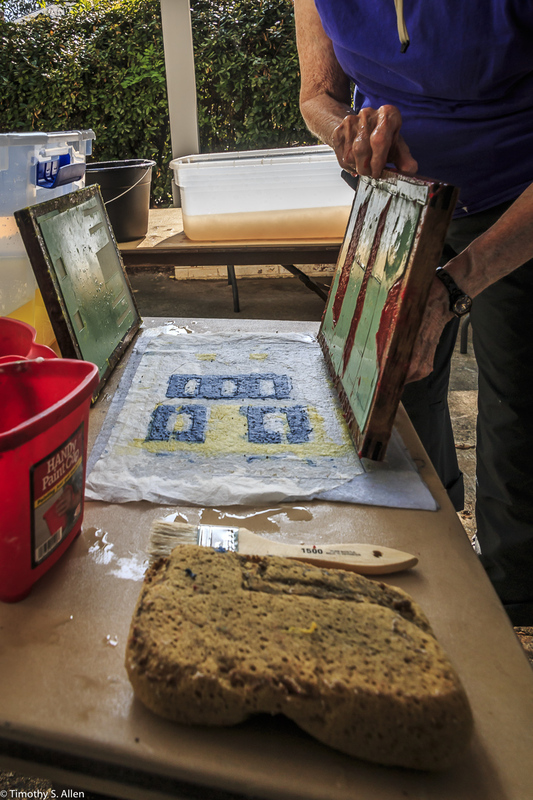 The first quilt block hanging outside the Gray Cottage to dry. 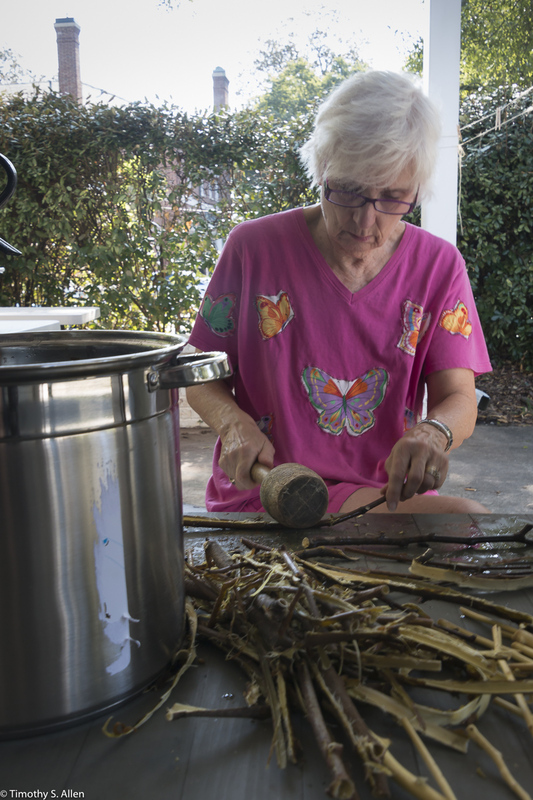 My sister in law Judy Berry beating twigs from a paper mulberry tree to get the bark for papermaking in Newnan. 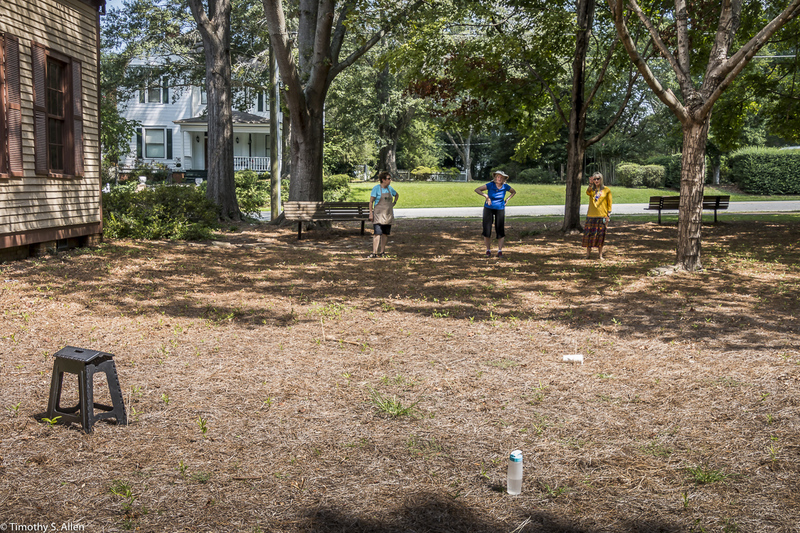 Many of my family members came to Newnan, and we had a family reunion! 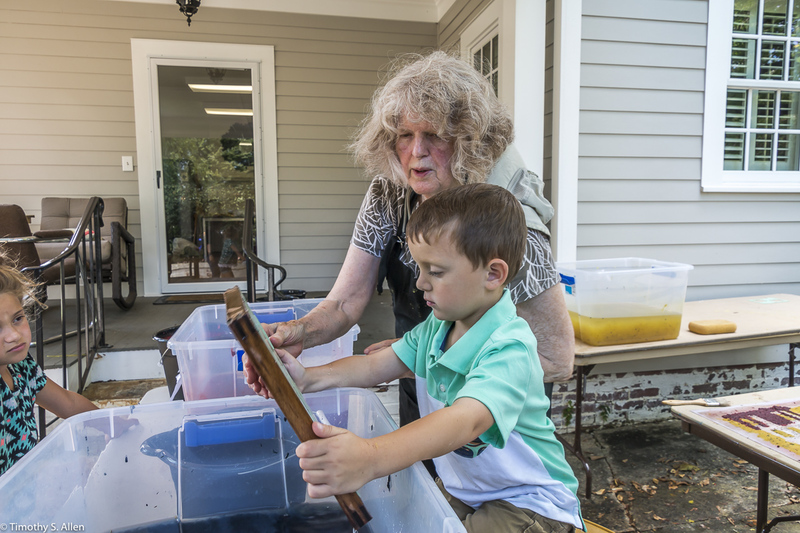 I am continuing my residency with Newnan Art Rez (www.newnanartist.org),and these photos by my husband Timothy S. Allen tell the story of what is happening. 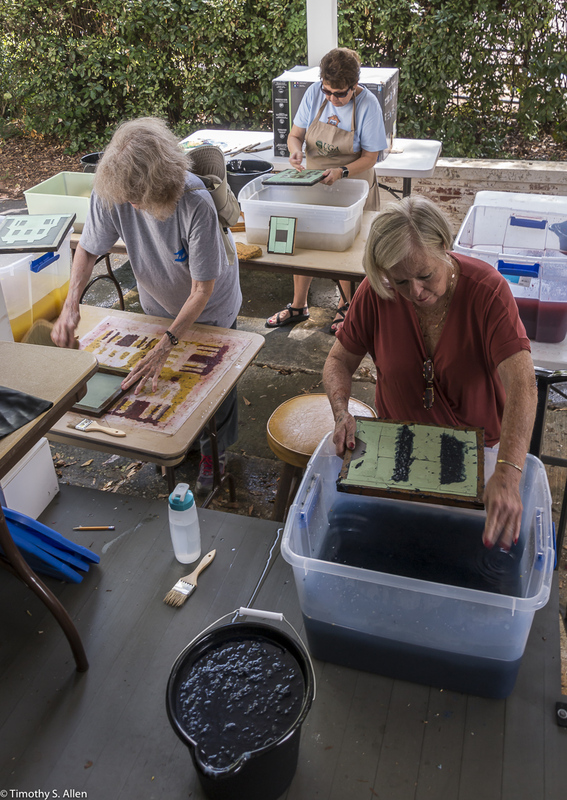 We are continuing to make blocks for the handmade paper “eco-quilt” in a house pattern that will be put on the prepared bed of soil on August 31 in Newnan at a site near the corner of College and Temple next to the Veteran’s Park and the children’s museum (site of the old Male Academy in Newnan). 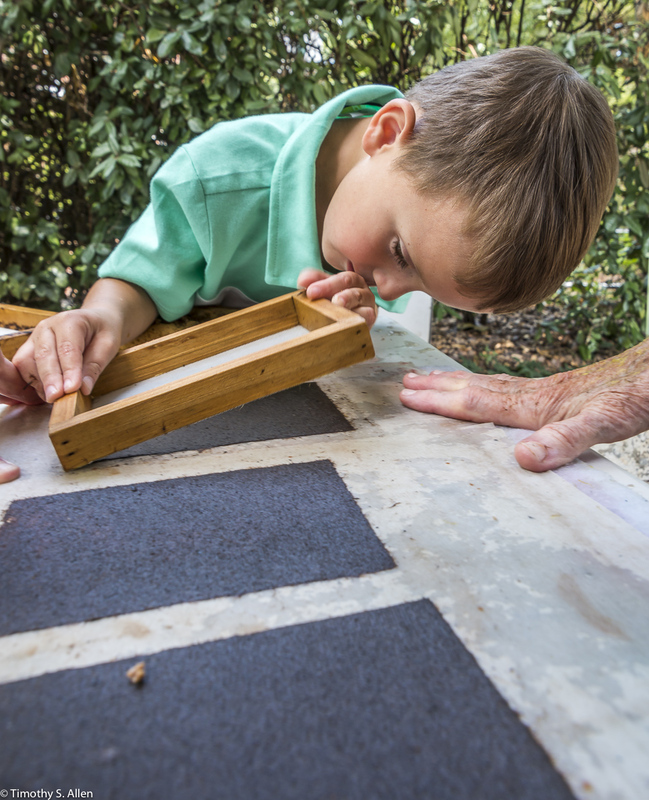 The handmade paper quilt contains seeds for wildflowers in the same colors as the pattern. 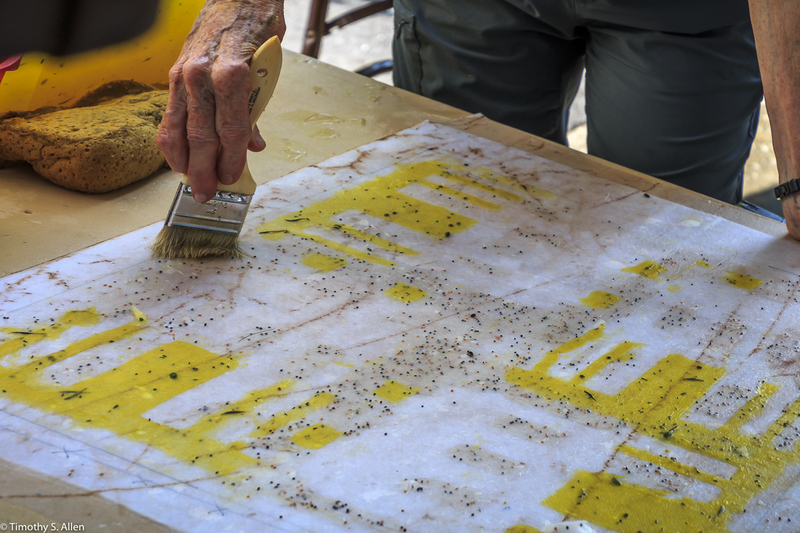 Over time as the all biodegradable handmade paper quilt dissolves into mulch, the seeds will sprout and grow and bloom as wildflowers to make a continually evolving public artwork in Newnan. 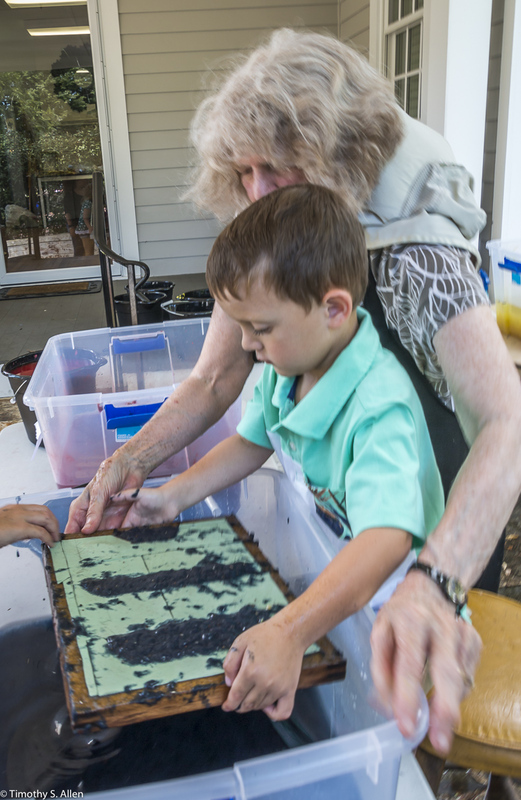 We are cooking and making paper pulp from several plants common in Newnan to add to the paper pulp: crepe myrtle bark, Eastern red cedar tree bark and red mulberry tree bark. Yesterday we gathered some magnolia tree bark, and we will start preparing it today. 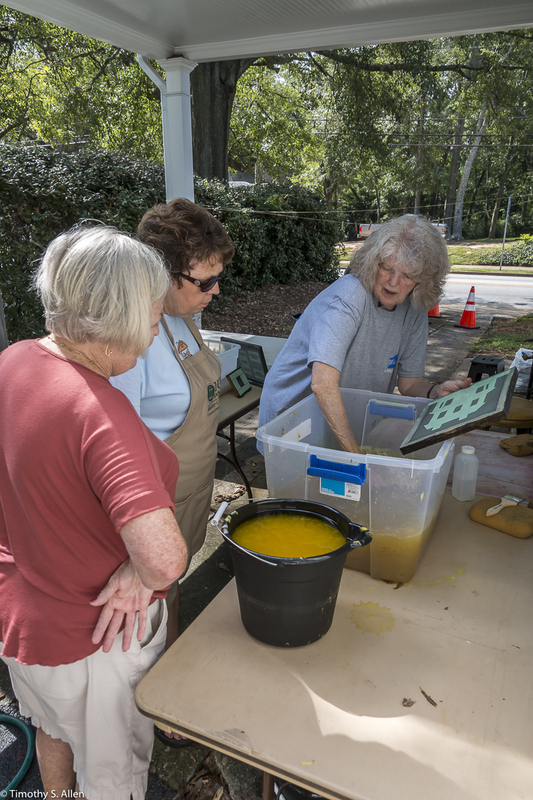 Volunteers from the Master Gardener’s group in Newnan came to help yesterday and learn the process. 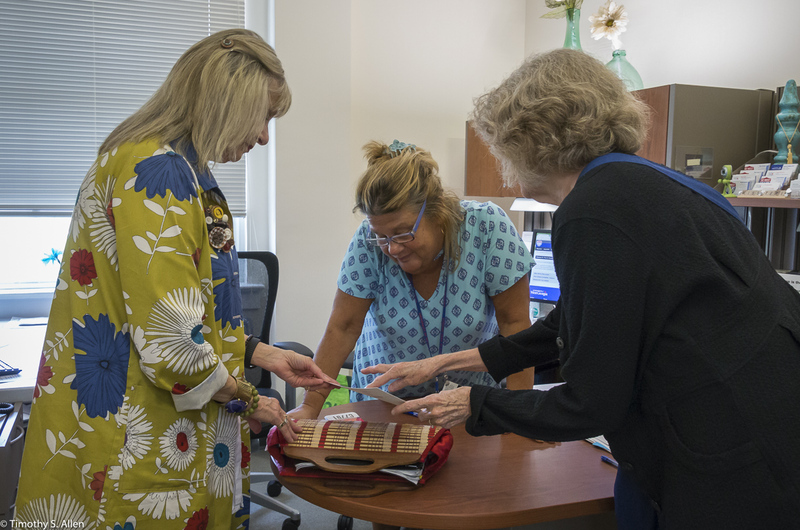 Other community volunteers also came by in the afternoon to participate and observe the process of making the Newnan eco-quilt. 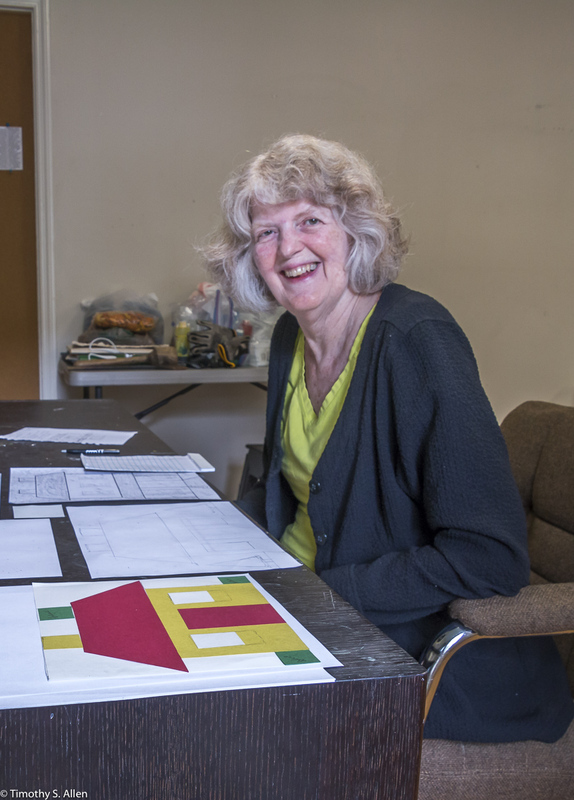 We plan to make a 60 inch by 80 inch queen size bed quilt and need 12 of the 20 inch squares that are made from 4 sheets of paper that are in 4 layers each. 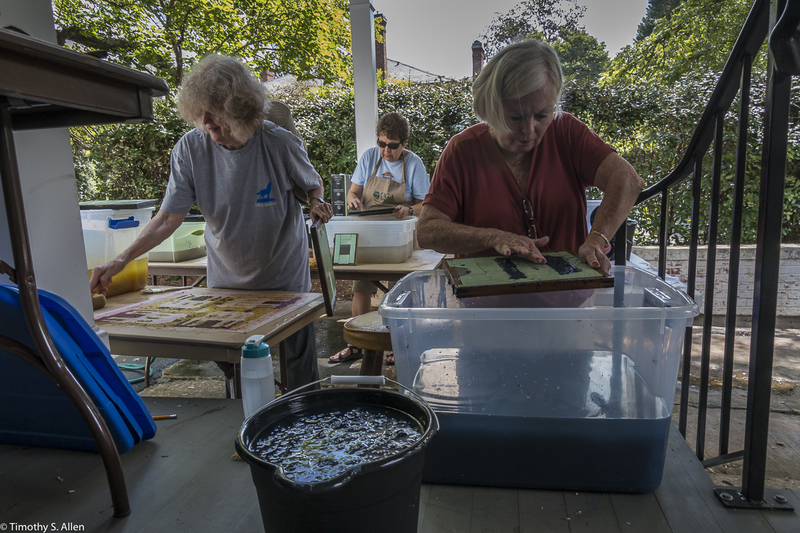 So that means lots of papermaking! 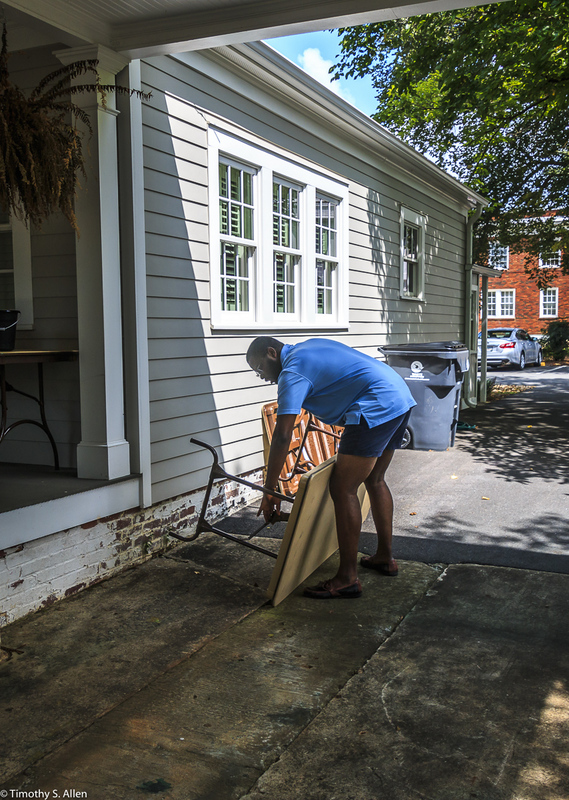 We are working outdoors in the carport and front porch area at Gray Cottage, 23 Clark Street in Newnan. 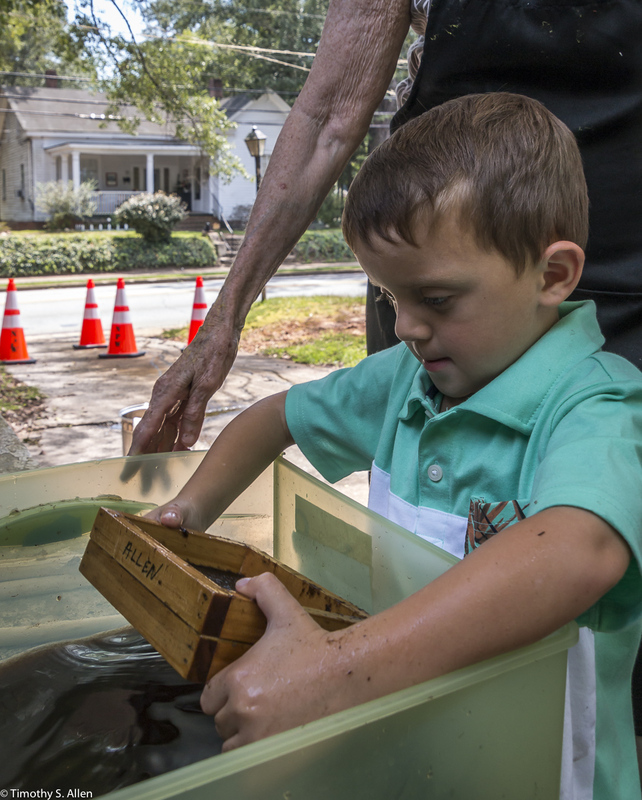 I will keep posting photos about the project, and more information about the dedication ceremony and installation of the “flower bed” for Newnan will be posted here soon. 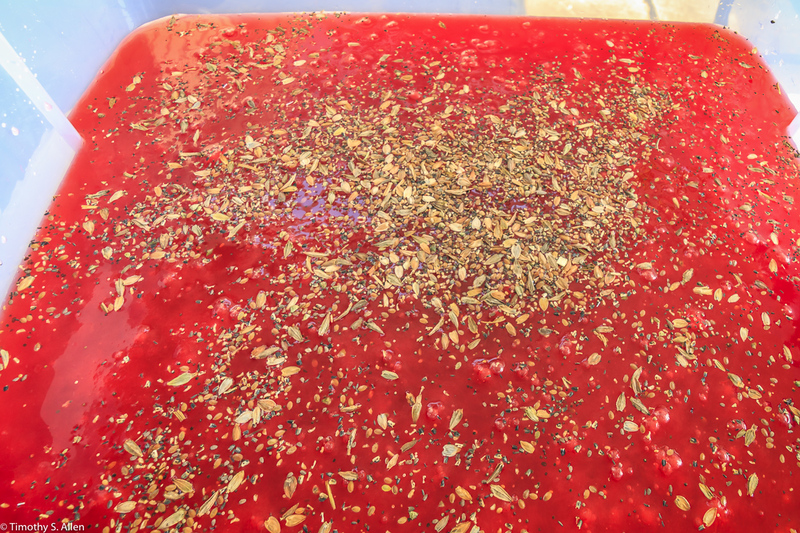 Keep watching this Blog to see the outcome of the project. Photos here are by Timothy S. Allen (http://allentimphotos2.wordpress.com). 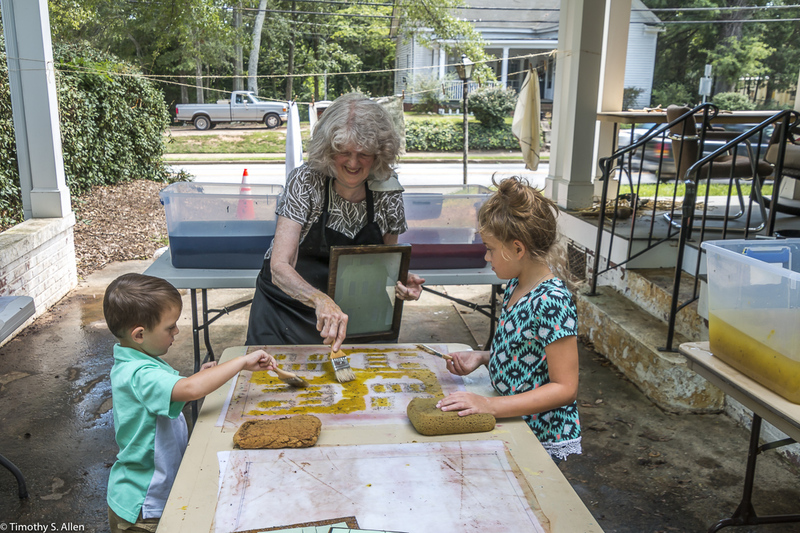 After arriving late Tuesday, I have had several days to get settled in and local materials and supplies I need to start making handmade paper from local plants and creating a Newnan Eco-Quilt installation. 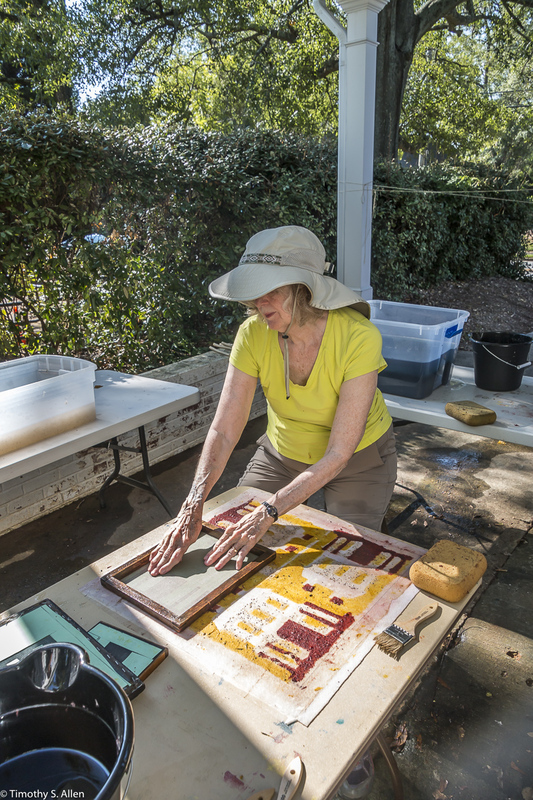 We also set up an outdoor working area for the papermaking and cooking of the plant materials, and looked at several possible sites for the outdoor installation that will be a “flower bed” with a handmade paper quilt having seeds for wildflowers in the pulp that will change over time to be a living, blooming quilt after the handmade paper dissolves into mulch. 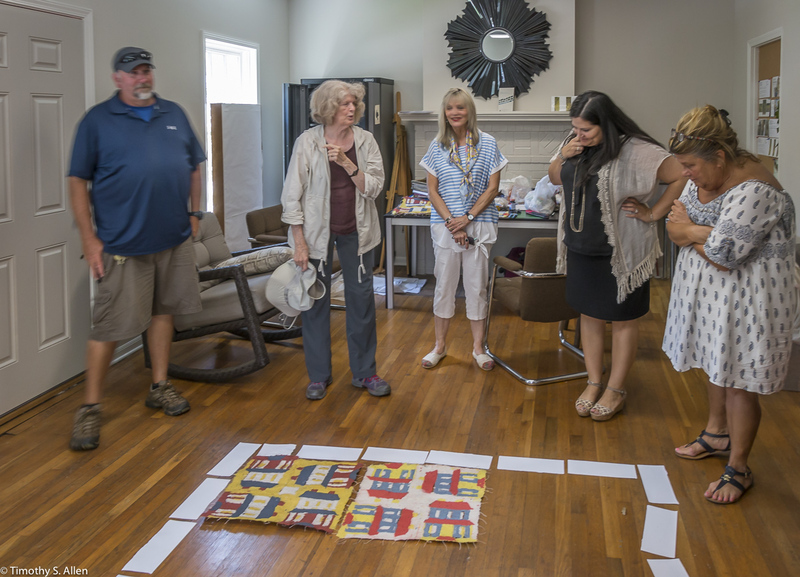 The Newnan quilt will have a house motif since Newnan is known as “the city of homes”. 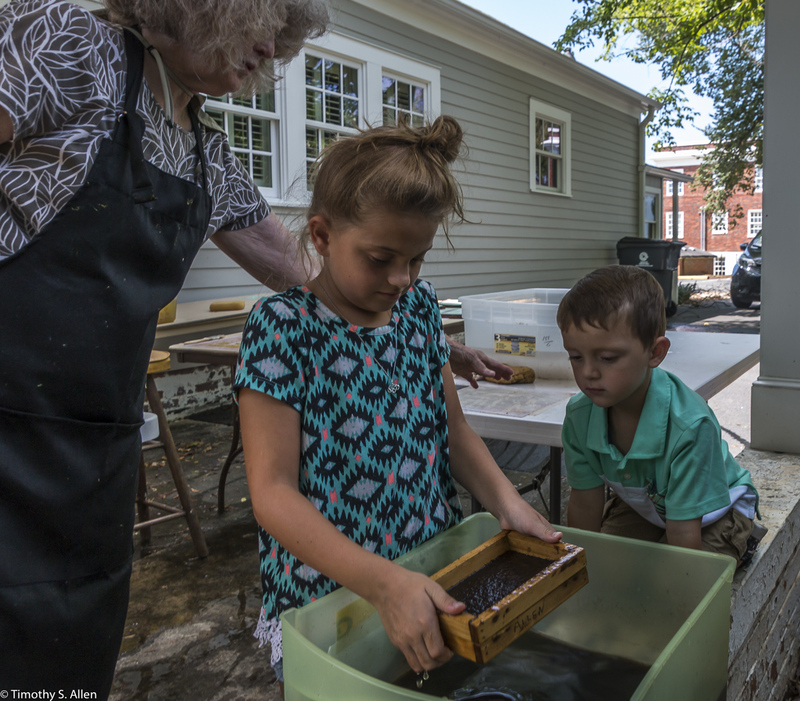 The site we have decided on is at the corner of Temple and College Street and next to the Children’s Museum and Veteran’s Park. It will be a great spot and should have many people passing by to take a look and enjoy the installation. 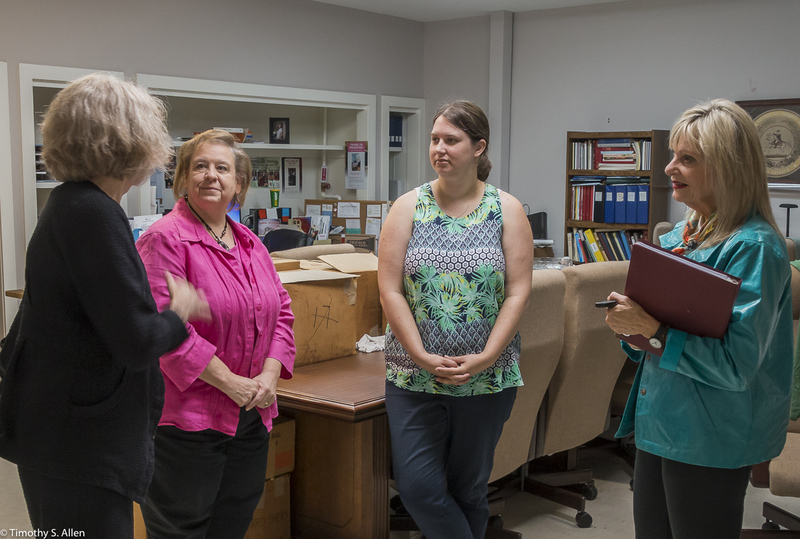 I also met the staff at the historical museum and many people at the University of West Georgia branch that is just behind the Gray Cottage. I am hoping to get lots of participation from the university staff and students and from visitors to the museum. 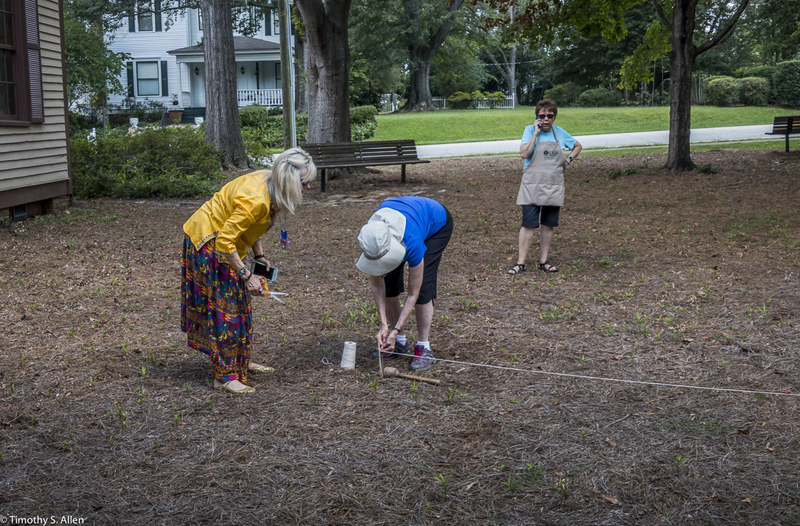 I also gathered some plant materials at the historical museum grounds next door to the Gray Cottage where I am staying in Newnan as the artist in residence at Newnan Art Rez (http://newnanartist.org). 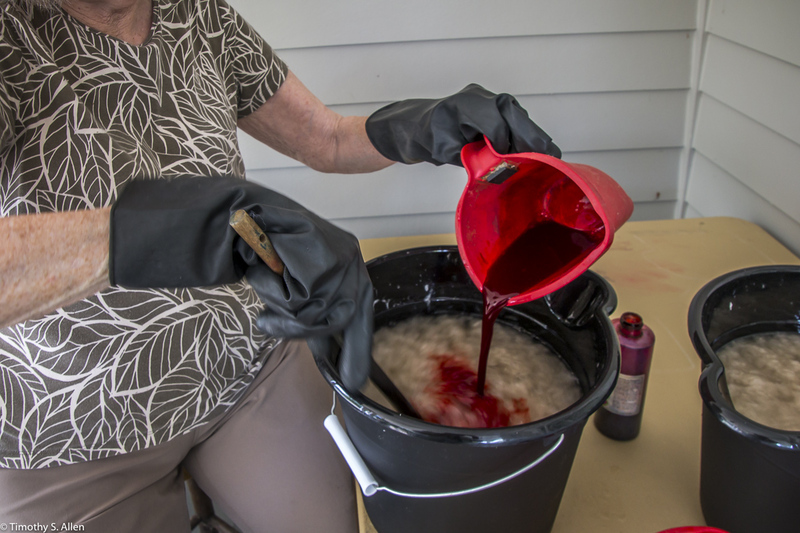 The plants I gathered are bark from Eastern Red Cedar trees, bark from crepe myrtle trees and bark from a huge red mulberry tree with some branches hanging down low enough to need trimming. 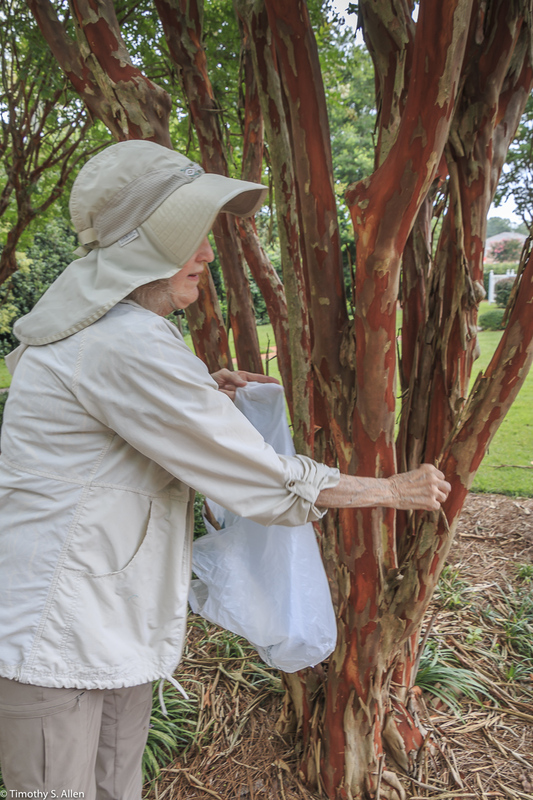 The bark from the cedar trees and the crepe myrtle flakes off naturally so there is no need to trim the trees. 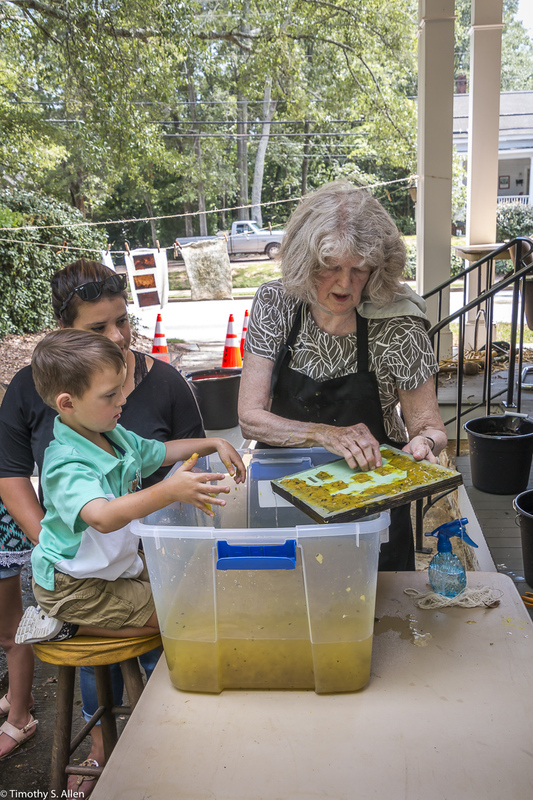 I will also be looking for other plant materials to make paper in the Newnan area, and I will meet with some master gardeners on Tuesday. Here are some photos of the past few days taken by my husband Timothy S. Allen who is with me for this residency in Newnan, GA. 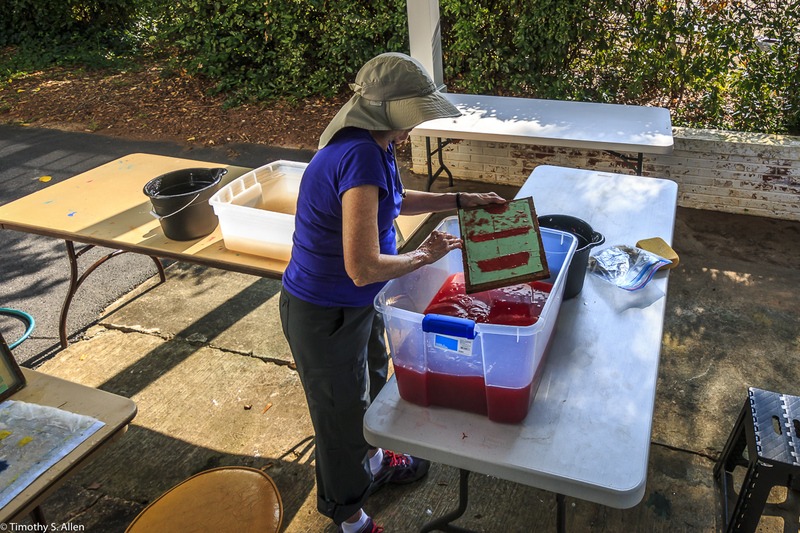 I am now working in Newnan, Georgia, as artist in residence at Newnan Art Rez. 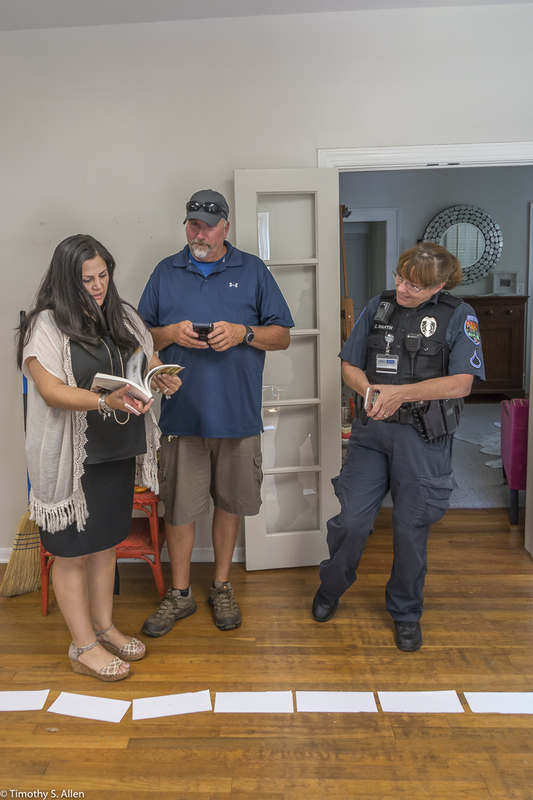 I arrived late in the evening on August 8, after a delayed flight and getting from the Atlanta airport to the city of Newnan, about 45 minutes southeast of Atlanta. 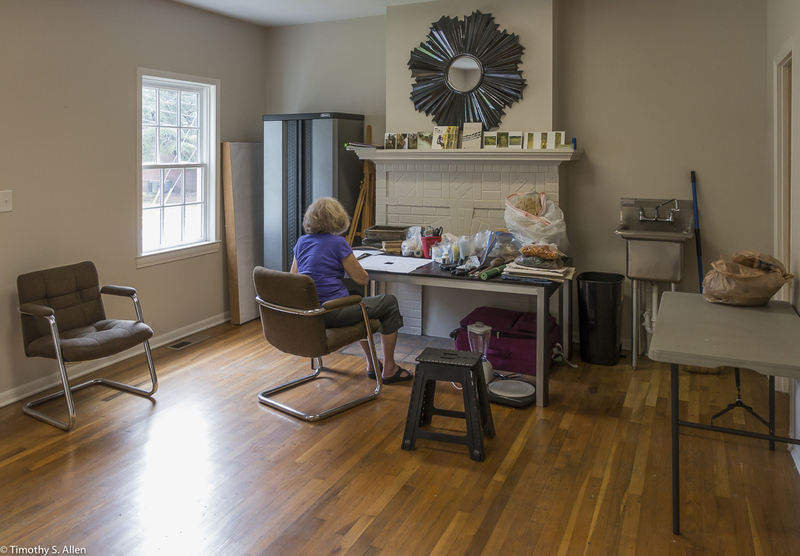 We are staying at the Gray Cottage, in downtown Newnan, and it is a great space with a studio room and lots of space. My husband Tim came with me, and he will be taking lots of photos to document the Newnan art project. Here is a photo Tim took yesterday of Gray Cottage. I am now figuring out what I will create and getting started to work. 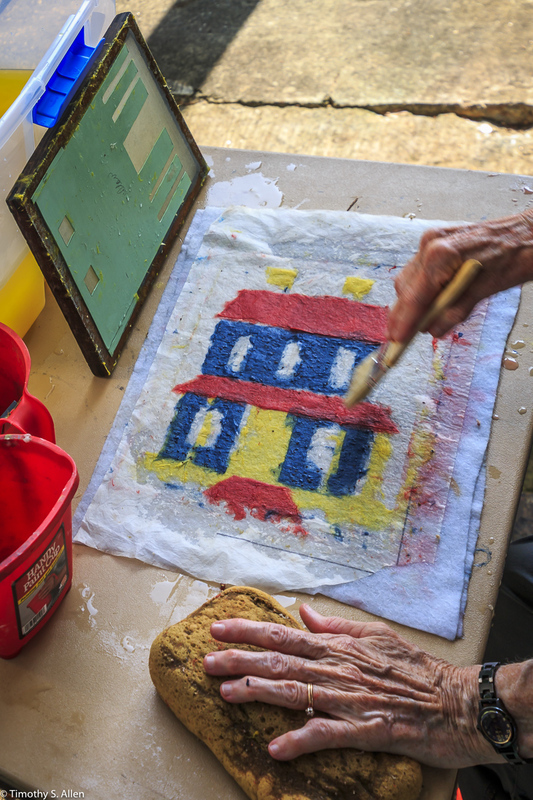 I plan to make a handmade paper quilt and am thinking to use a house theme, since Newnan is known as the “city of homes”. 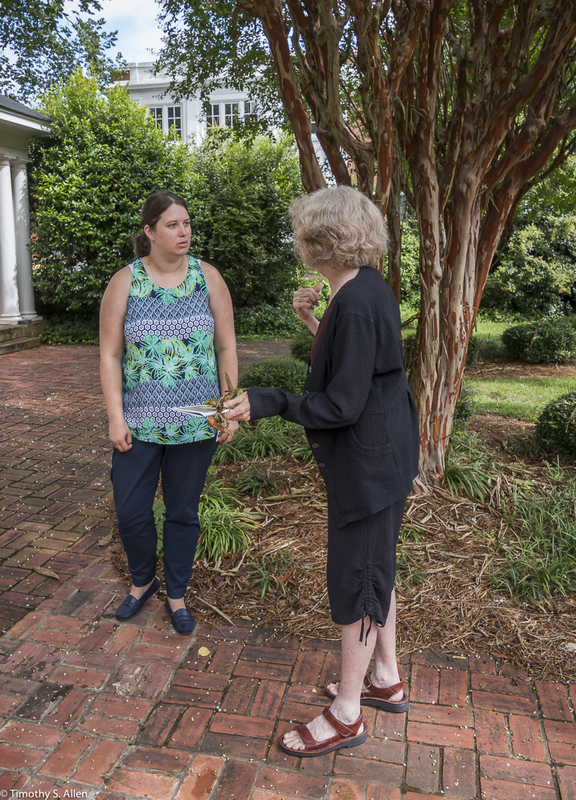 The town is filled with many beautiful old Southern homes, and we look forward to the time here reconnecting with my Southern roots. I have ancestors on both sides of my family who first settled in Newnan after coming to America in the 1700s and 1800s from Ireland and Scotland. 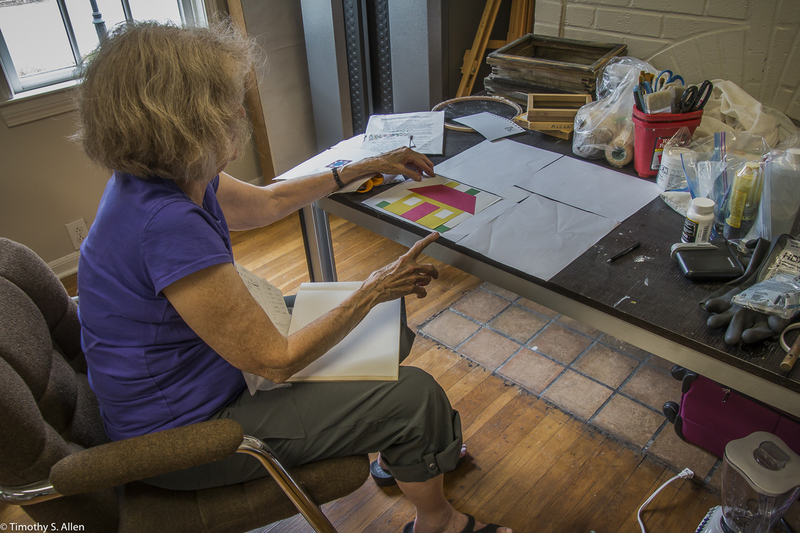 These photos show me working in the studio room on sketches for the “house” quilt idea. 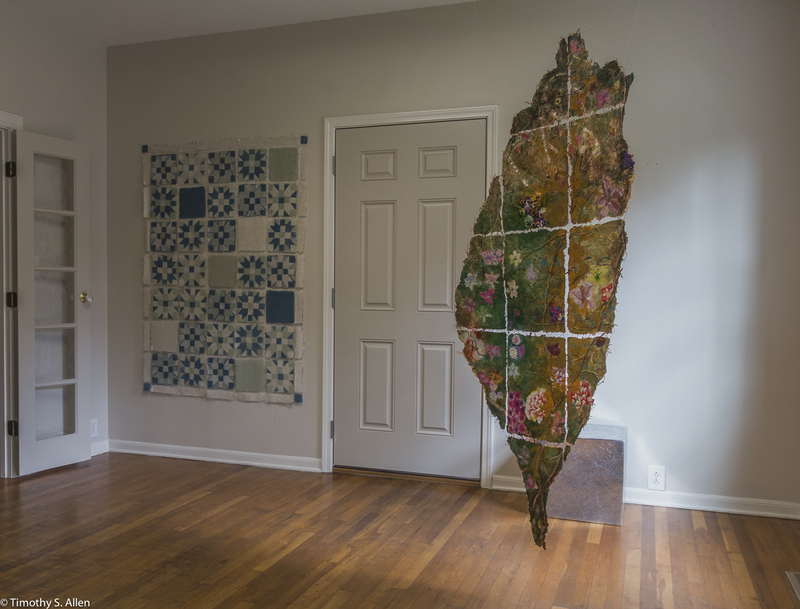 I also hung a couple of older handmade paper artworks that I brought with me in the studio space at Newnan Art Rez. 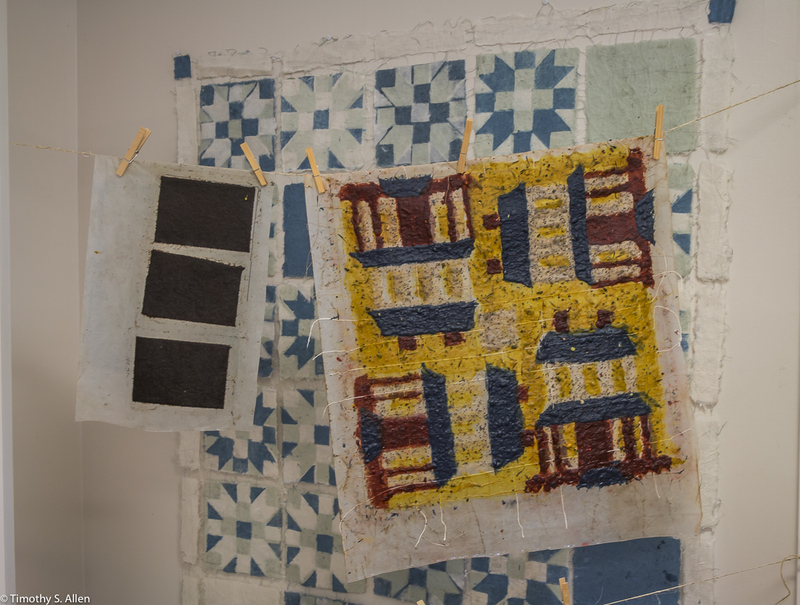 Here you can see a Sitka Paper Quilt created in 2014 at my residency at Sitka Center for Art & Ecology, Otis, Oregon, and a Taiwan Site Map created in 2004 during my first Fulbright Scholar award artist in residency in Taiwan. 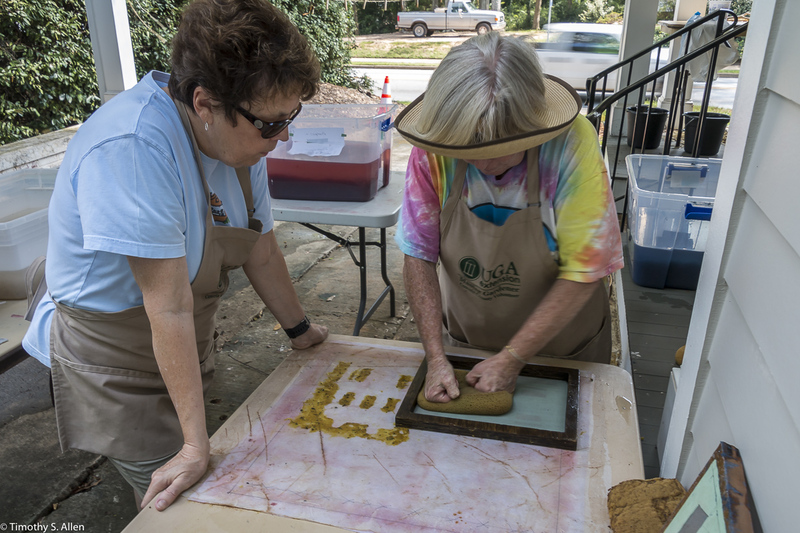 Today I plan to meet with some Newnan Art Rez volunteers and look for materials and supplies to start the hand papermaking activities in Newnan. 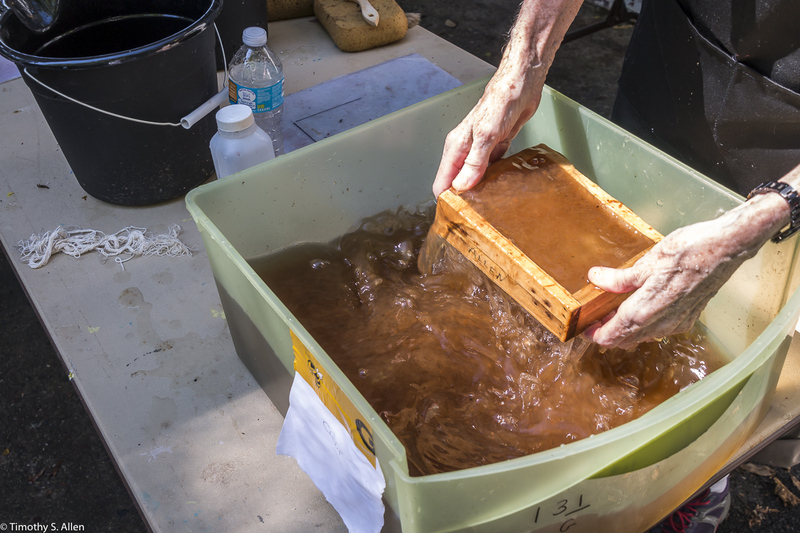 Hope I can find some interesting plants here to make paper.